The HG6250BL is a four burner gas hob with front controls. This hob provides functional and efficient cooking for the user with dishwashable enamel pan supports, wok burner and flame failure as standard. The HG6250SS is a four burner gas hob with front controls. This hob provides functional and efficient cooking for the user with dishwashable enamel pan supports, wok burner and flame failure as standard. The HG6350LSS is a four burner LPG ready gas hob in stainless steel. This hob provides functional and efficient cooking for the user with a sleek stainless steel finish. Features include: wok burner, dishwashable cast iron pan supports, automatic ignition and flame failure as standard. The HG6350SS is a four burner gas hob in stainless steel. This hob provides functional and efficient cooking for the user with a sleek stainless steel finish. Features include: wok burner, dishwashable cast iron pan supports, automatic ignition and flame failure as standard. This stylish bevelled glass gas hob in black would make a real statement in your kitchen. The HVG66BL hob has four burners with different functions to meet all your cooking needs. It is also fitted with a flame failure safety device and comes with a LPG conversion kit, so that even if you are not connected to the mains gas you can install this product. This stylish bevelled glass gas hob in black would make a real statement in your kitchen. The HVG77BL hob has five burners with different functions to meet all your cooking needs including a central wok burner. It is also fitted with a flame failure safety device and comes with a LPG conversion kit, so that even if you are not connected to the mains gas you can install this product. The HVG77BL also fits in a standard 60cm cutout for extra flexibility when installing. This stylish frameless glass gas hob in black would make a real statement in your kitchen. The HVG93FR hob has four burners with different functions to meet all your cooking needs including a wok burner. It is also fitted with a flame failure safety device and comes with a LPG conversion kit, so that even if you are not connected to the mains gas you can install this product. This stylish bevelled glass gas hob in black would make a real statement in your kitchen. The HVG96BL hob has five burners with different functions including a wok burner to meet all your cooking needs. It is also fitted with a flame failure safety device and comes with a LPG conversion kit, so that even if you are not connected to the mains gas you can install this product. The designer HVG670SS is a 60cm four burner gas hob on a stylish stainless steel base with cast iron pan supports. The hob has 1 ultra rapid burner with a 4kW rating giving more power than a wok burner, along with 2 semi-rapid burners and an auxiliary burner to cater for all cooking styles. The HVG670SS also has a flame failure safety device for peace of mind. 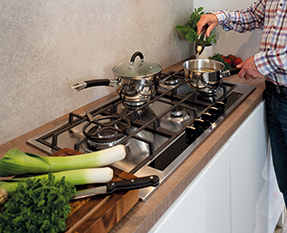 The designer HVG970SS is a 90cm four burner gas hob on a stylish stainless steel base with cast iron pan supports. The hob has 1 ultra rapid burner with a 4kW rating giving more power that a wok burner, along wit 2 semi rapid burners, 1 rapid burner and an auxiliary burner to cater for all cooking styles. The HVG970SS also has a flame failure safety device for peace of mind. We have included 2 domino, 2 zone gas hob models that allow you combine gas cooking with other styles in your home and both models are in the gas on glass style with cast iron pan supports. The front, rotary control makes them easy to use and practical for quick cooking in the kitchen. There is also a full range of 4 zone gas hobs, our most popular size, in a range of configurations. Choose between front control or side controls for extra safety and extra colour options in black as well as the popular brushed stainless steel. We offer enamel pan supports on some models which are fully dishwashable and cast iron pan supports on other models, which must be washed by hand but are stunning to look at. In the larger sizes, there are 5 and 6 zone gas hobs in a range of configurations, with extra powerful triple wok burners for powerful frying and boiling. You can also choose your layout configuration, depending on how you use the hob, with larger or smaller zones at the front and even a side by side linear option. Our gas on glass range looks beautiful in any kitchen and are tested to withstand the same use as our steel models. The striking cast iron pan supports stand out from the smooth glass base perfectly. Take a look at our HVG range for the latest designs and configurations available. Combining the best of both technologies, the new indu-gas hob features a powerful and responsive induction hob with an integrated wok burner to the side allowing you to have both cooking styles in one layout. Not forgetting the Q-style range which combine brushed steel and black glass for a stylish aesthetic and have plenty of space between the burners for comfortable cooking. Click here to take a look at the matching Q-style oven. Cleaning is not as difficult as it may seem with a CDA gas hob as the pan stands and burner caps can be easily removed to leave a smooth glass or steel surface to wipe down, before returning the pan supports. All our gas hob models also come with an LPG conversion kit, included as standard. So if you are installing your hob in a property without mains gas, you can always fit them to a gas model. This makes our gas hob range one of the most flexible for installation available. We have added extra features to the range to provide a smoother performance. Wok burners are available on some models to give extra cooking power when you need it and automatic ignition with a flame failure safety device give peace of mind in the kitchen. Whichever style you go for, you are guaranteed a responsive cooking experience with gas.